In October, the National Library of Medicine will open a new exhibition, Native Voices: Native Peoples’ Concepts of Health and Illness. The exhibition, which will examine concepts of health and medicine among contemporary American Indians, Alaska Natives, and Native Hawai’ians, will feature a healing totem pole intended to promote good health. As a prelude to the exhibition, the totem will travel from Washington state, where it was created, to the NLM, where it will stand. The totem will be transported on a truck and will stop for tribal blessings in nearly a dozen states as it makes its cross-country trip. To chronicle and celebrate the meaning and movement of this magnificent piece of art, NLM launched a healing totem journey blog. 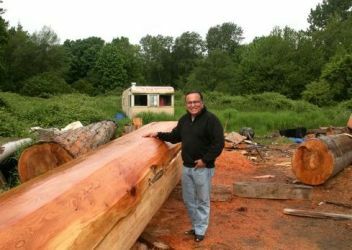 The blog gives readers a behind-the-scenes look at the totem process—from the selection of the tree through its design, carving and decoration, to its trip across America. The totem and two benches will be placed in the herb garden in front of NLM. They are the work of master carver Jewell Praying Wolf James of the House of Tears Carvers of the Lummi Indian Nation in Washington state, who created the totem especially for NLM. James is an internationally known artist. Previously, he carved three memorial totem poles to honor victims of 9/11. The blog features information about James, his work, the significance of the carvings and colors on the healing totem, and much more. The posting and comments tracked on the blog as the totem travels across the country will become part of the archive of events preceding the totem’s installation at NLM and reside as a resource on the Native Voices: Native Peoples’ Concepts of Health and Illness exhibition Web site. The healing totem begins its journey on September 12. The Native Voices exhibition opens to the public October 6. August 8, 2011 in Exhibitions, Featured Articles, Products.